Roughly halfway between the staggering standing stone at Kintraw and the farmhouse of Salachary a coupla miles east along the A816 road to Kilmartin, a small overgrown car park nearly hides on the south-side of the road, just below the forestry. 50 yards west of this, a small track winds uphill. 650 yards (0.6km) up here, once it levels out, a hairpin in the track veers NW; ignore it, instead walking into the marshy grass in front of you (south) for 50-60 yards up and round the small rocky crag. Once you get round the edge of this, immediately east, you’ll see one of the tall monoliths 50 yards ahead of you. 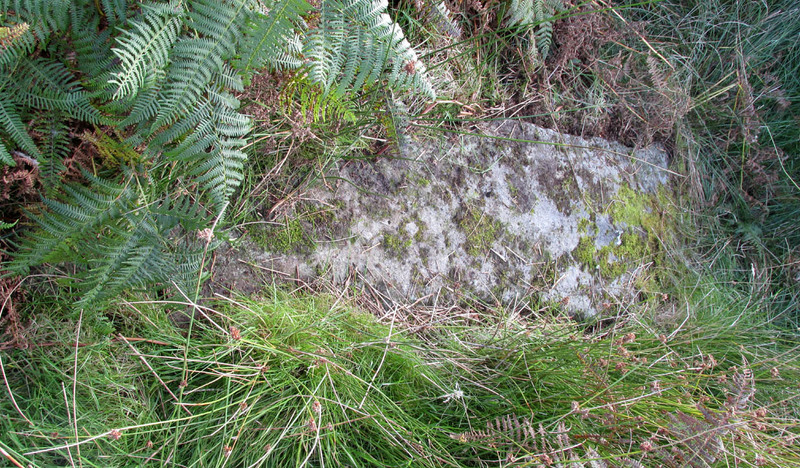 Rediscovered in recent times by Marion Campbell (1962), this damaged row of three tall standing stones is cited in Swarbrick’s (2012) poorly-arranged survey as being “difficult to find in broken ground”; although patience brings the stones clearly into sight for any explorer. They’re big too! Sadly only one of them still remains fully upright—but that one’s nearly 9 feet tall! 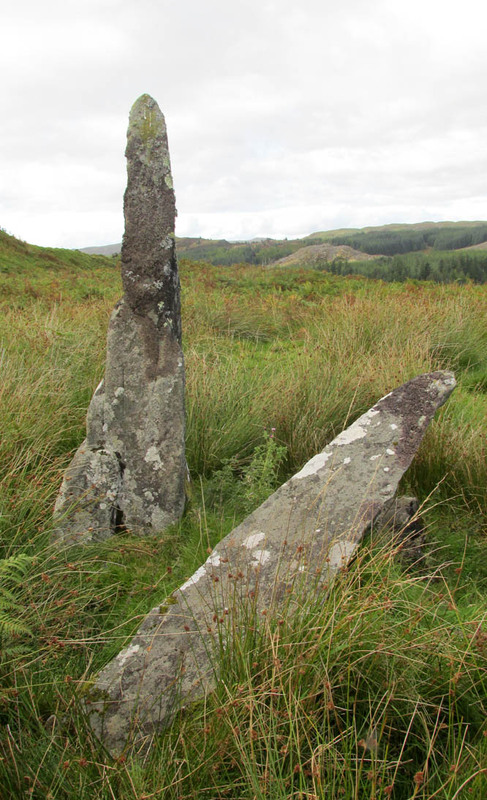 “A chance sighting led to the discovery of a group of three monoliths, one erect, one sloping and one prostrate, on the West side of a wide glen leading S from the upper part of the Bealach Mor; the site commands a fine view into the northern hills. 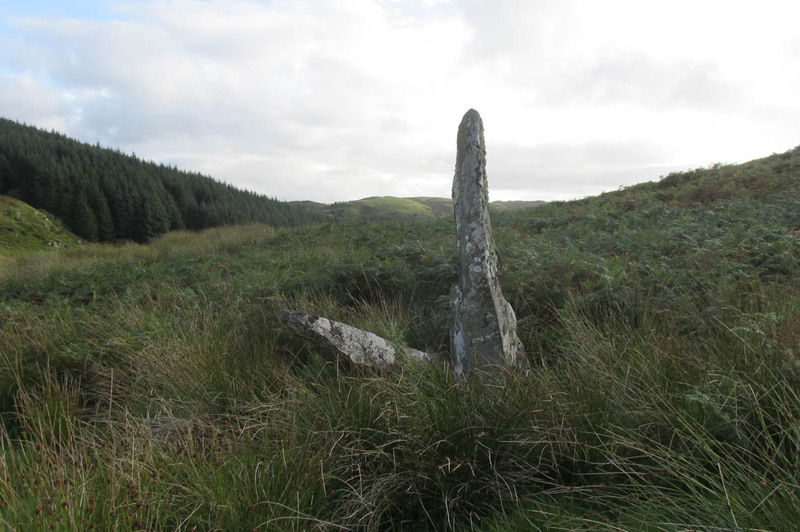 The spot is about 550ft above sea level and this is therefore the highest group of standing stones so far recorded in the area. Indeed, no subsequent investigation has led to either an early name nor any traditions about the site, and the stones cannot be found on any early maps of the area. A pity, as they’re quite impressive stones and would have had some old stories known of them in ages gone by. 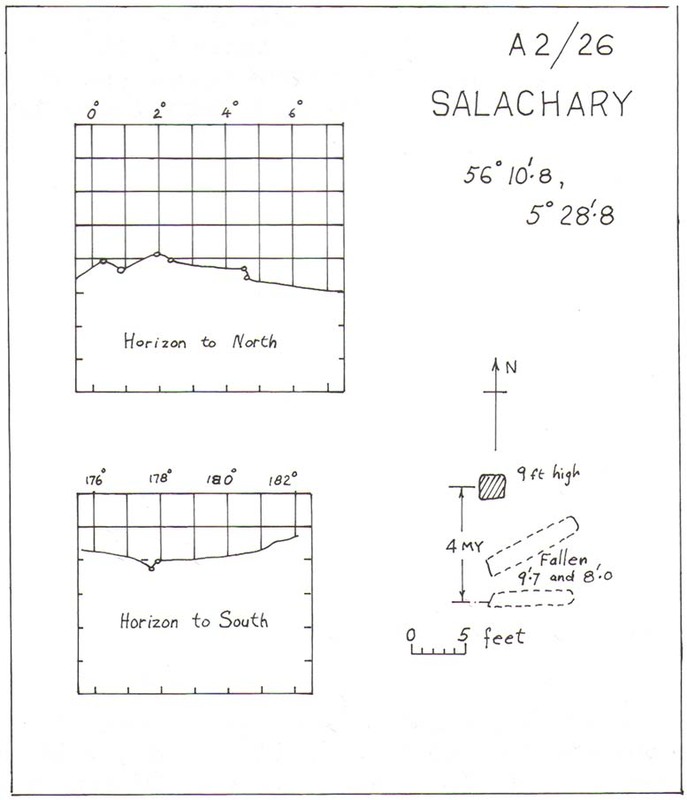 Around the same time, Clive Ruggles (1984) assessed the Salachary stones for any potential astronomical alignments and found—as Alexander Thom & Aubrey Burl did in their own survey (1990)—that as they pointed virtually north-south they stood beyond any solar or lunar functions. Thom found the stones align almost perfectly north-south, with a notch in the southern horizon at 178°, and on the northern horizon the hilltop of Meall Reamhar at 2° west of north. 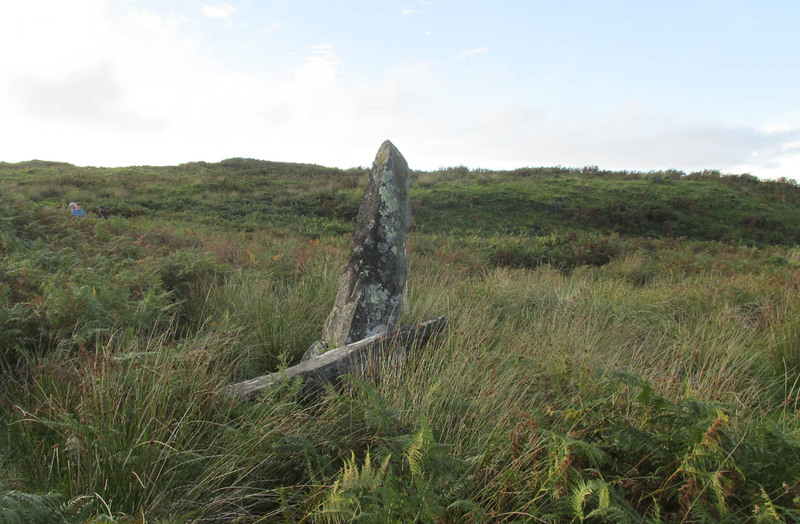 This northern line may relate to the airt of death, although no other immediate archaeological remains have been found to fortify this idea (however, other unrecorded standing stones are close by and their relationship with Salachary has yet to be adequately assessed). In truth, the main north-south axis relates to the more open geological avenue of the landscape. Both the east and west are all but blocked by crags and hills, and the stones seem to have been positioned to echo the hollowed section of the landscape. The land runs in curious geological folds and has a distinct genius loci which I enjoyed in differing (usually wet) conditions when I used to live nearby. The site is well worth a walkabout if you’re in the area – and there are more unrecorded stones still hiding in Nature’s rocky folds nearby. 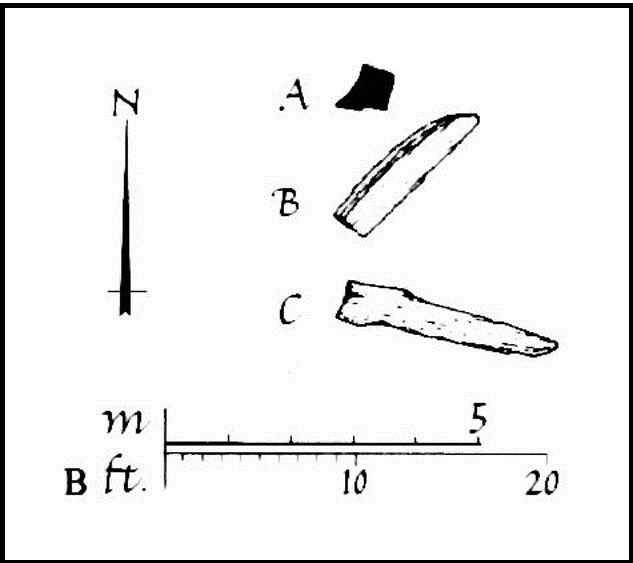 Campbell, M. & Sandeman, M., “Mid Argyll: An Archaeological Survey,” in Proceedings Society Antiquaries Scotland, volume 95, 1964. Campbell, Marian, ‘Salachary, Kintraw’, in Discovery & Excavation Scotland, 1962. Ferguson, Lesley, “A Catalogue of the Alexander Thom Archive Held in the National Monuments Record of Scotland,” in Records in Stone (ed. C. Ruggles), Cambridge University Press 1988. Royal Commission on the Ancient & Historical Monuments of Scotland, Argyll – volume 6: Mid-Argyll and Cowal, HMSO: Edinburgh 1988. Ruggles, Clive L.N., Megalithic Astronomy, BAR: Oxford 1984. Ruggles, Clive L.N., “The Stone Alignments of Argyll,” in Records in Stone (ed. C. Ruggles), Cambridge University Press 1988. Swarbrick, Olaf, A Gazetteer of Prehistoric Standing Stones in Great Britain, BAR: Oxford 2012. Weston, Garth, Monuments and Mountains, Ashridge: Bakewell 2007. Acknowledgements: This site profile could not have been written without the help and of Nina Harris, Paul Hornby, Frank Mercer and Belinda Sales. This entry was posted in Argyll & Bute, Scotland, Standing Stones and tagged airts, ancient sites, antiquarian, antiquities, Archaeology, Ardfern, Argyll, Bronze Age, Ford, heritage, Kilmartin, megalithic, Megaliths, monoliths, neolithic, prehistoric sites, sacred sites, Scotland, Standing Stones, stone rows. Bookmark the permalink.